We already know there’s a lot happening around urban and vertical farming in New York City. Yet around spring 2018, Square Roots might be the most empowering project just yet. Tobias Peggs & Kimbal Musk (Yes indeed, brother of Elon) started a platform and a hands on accelerator program in the middle of Brooklyn. 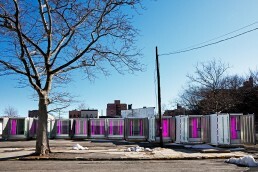 In 10 vertical farming containers, 10 young entrepreneurs can do their thing for 1 year. 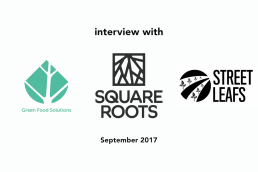 We had the honour to go and talk to Jonathan Bernard and Electra Jarvis, two Square Roots entrepreneurs that were finishing their first year at SR. The Square Roots program works. Electra & Jonathan are the living proof of that. They grabbed this opportunity with both hands, chased their dreams and made it happen. Both Electra and Jonathan have started up their own company during the program. Both Green Food Solutions & Street Leafs are now making New York City a happier and healthier place. Both Jonathan & Electra go about their business very differently. In this episode they explain why and how, moreover, they also talk about the other entrepreneurs in the Square Roots program. A happy bunch.